Among the clouds there are many invisible boundaries that pilots must adhere to. Established for security concerns, special events, or even defining the rules of flight for airspace surrounding an airport, these boundaries are important to know about before each flight. One of the most widely known types of airspace is the Special Flight Rules Area, or SFRA, around the nation’s capital of Washington D.C. 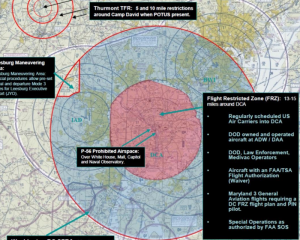 The D.C. Special Flight Rules Area was developed in response to the attacks on September 11th and envelops the area surrounding Washington DC and extends outward and includes major airports such as Baltimore and Washington Dulles. In order to fly within this region, special training of SFRA procedures is required first. Recently, our friend and customer over at Art’s Aviation Website discovered the FAA made some changes to the SFRA required course and the majority of the pilot population has yet to discover this update. There is now a new course published that contains NOTAM’d (notice to airman) changes to include the Leesburg Maneuvering area updates. The updated course can be completed here: http://www.faasafety.gov/gslac/ALC/CourseLanding.aspx?cID=405. All graphics and a helpful kneeboard checklist included in this updated course can be downloaded on Art’s Aviation Website in his SFRA section. No worries, if you have completed the FAA Safety SFRA course previously, you do not need to re-take it. However, it is always beneficial to brush up on the regulations of a very stringent area. The agents at Aviation Insurance Resources (AIR) are also pilots that fly often in and in the vicinity of the Washington DC airspace. We believe it is our duty to notify our customers and pilot friends about important changes to the airspace in our area to reduce their chances of an unintentional infraction. To contact Aviation Insurance Resources to receive an aircraft insurance quote at the best rate and broadest coverage available call 877-247-7767. You can also visit AIR-PROS.com today to fill out an online application. You can also follow us on Facebook, Twitter, LinkedIn, and Google+.